Back home in New England, nearly everyone is still freaking out that Johnny Damon signed with the Yankees. He’s a traitor and a sellout, he sold his soul for a few extra bucks, he’s Judas, he’s Anakin Skywalker, he’s the Reverse Earl Hickey. That seems to be the general consensus. For an extra $12 million — actually, less than six million when you remove taxes and his agent’s commission — Johnny D burned his bridges in Beantown and tarnished every Sox fan’s memories of the glorious 2004 season. For that, he’s going to burn in hell. Apparently. Late Tuesday night, the e-mails started multiplying and piled into my mailbox for 48 straight hours. You have to write about this. You need to weigh in. You must be going crazy. Where’s your column? We need your take? Were you too angry to write rationally about this? Johnny Damon has ruined Christmas, WHERE ARE YOU????? YOU’RE A SELLOUT JUST LIKE HIM!!!!! Well, I’m right here. Perfectly calm. Not even remotely surprised. Wondering why I’m not more outraged by the whole thing. After Roger Clemens fled for Canada in 1996, I lost the capacity to be surprised/wounded/outraged/enraged by any athlete’s departure from Boston. Basically, Roger took my Sports Fan Cherry. Nineteen out of 20 times, I realized that athletes are loyal to dollar signs and that’s about it. That’s just the way it is. Two years later, when Mo Vaughn signed with the Angels and fans were alternately blaming Mo and Red Sox GM Dan Duquette. On WEEI, drive-time host Glenn Ordway would let them finish their rants, then grumble into his microphone, “It’s ALLLLLLLLL-ways about the money.” He kept saying those five words 10,000 times all winter. And maybe I hated hearing it every time … but Ordway was right. For every Bruschi or Varitek who values teammates, fans and community over his market value, 19 Damons leap at the highest offer and never look back. That’s the way sports work. That’s the way life works. So why would anyone be shocked by Damon’s choice this week? Did you really think someone who wrote an autobiography in which he bragged about adultery would do the right thing? More important, what WAS the right thing? Is it even for us to say? For instance, let’s say your buddy has spent eight quality years working for a law firm. He loves everyone in his office, loves his job, never imagines going anywhere else … and then another law firm comes swooping in and offers him a partnership and big bucks. And let’s say he asked you for advice. Well, you know what you would do? You would tell him to take the big bucks. You would. I’m telling you … you would. And when he does so, you would praise him for doing the right thing for his family. That’s the way life works. With sports, for whatever reason, we expect athletes to do the right thing … for us, not for them. When they choose themselves, we act like they mailed us a pile of dog poop. Somehow they’re the ones being selfish. Fans can be incredibly unrealistic and naive. We expect athletes to maintain an unyielding loyalty to their current cities, even if they have been playing there for only 3-4 years. We expect them to understand the “importance” of something like the Sox-Yanks rivalry, to think exactly like us, to say to themselves, “Wait, I can’t switch sides to the Yankees, that’s our archrival!” We expect them to feel hatred for the teams that WE don’t like, ignoring the fact that rivalries thrive solely because of the fan bases, because we’re the ones keeping them alive. And we expect them to turn down Godfather offers out of loyalty to their fans, only we’ll turn on them the moment they start struggling. It’s a two-way street. We always forget this. When our favorite players struggle and we start grumbling and bitching, the message always remains the same: “Hey, he’s making a ton of money, I spend my hard-earned money on tickets, it’s my right as a fan to boo.” You never hear the word “loyalty” mentioned. Ever. These guys are only as good as their last few games. History rarely matters, which is fine, because that’s part of the bargain. Most players seem to understand that. But if that’s the case, why should we expect them to remain loyal to us? 1. Unleashed in New York, Damon could conceivably cross into the mainstream, yet another lovable, quotable, handsome celebrity/athlete who makes regular “Regis and Kelly appearances,” shows up at relevant magazine parties and movie premieres, maybe even gets his own ghostwritten column in the New York Post. He’s like a much savvier, gentler, less-stupid version of Dennis Rodman. And I mean that in a nice way. 3. Historically, the Yankees have always tried to stick it to Red Sox fans whenever they could — for further evidence, look at the baseballreference.com pages for Tiant, Boggs and Clemens. This is why we call them the Evil Empire. Add everything up and it made too much sense: Damon would leave for the Yanks. As it turned out, they needed to offer only an extra $12 million and Damon was more than willing to relinquish his status as a Boston icon, although I still think he would have stayed had one of the 29 people running the Red Sox upped the team’s offer at the last minute. And that’s why Red Sox fans think that they’re upset, because they can’t believe Damon would turn his back on Boston fans and join the dark side that abruptly, especially after vowing that he would never play for the Yanks. Of course, had Johnny re-signed with Boston and slumped out of the gate, the fans would have booed him and complained all summer about his gaudy contract. It’s a double-edged sword, one that we notice only when it’s plunging into us. Anyway, if you’re a Red Sox fan, I hope you learned two things this week. First, the Sox-Yankees feud matters infinitely more to us than it does to the players. That’s why these guys have no problem switching sides. They just don’t give a crap. Sadly, we do. And second, to paraphrase Ordway, it’s almost always about the money. Bonds left Pittsburgh. Clemens left Boston. Shaq left Orlando. Kareem left Milwaukee. Giambi left Oakland. Walton left Portland. Mussina left Baltimore. Kemp left Seattle. A-Rod and Griffey left Seattle. Within the next three years, LeBron will leave Cleveland. With only a few exceptions, it’s ALLLLLLLLL-ways about the money. 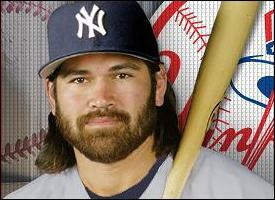 Johnny Damon? He’s just the latest reminder. And sure, I’m rooting against him next season and plan on booing him in person when I have the chance. But Damon’s departure didn’t taint 2004 for me … if anything, he reminded me that most of these guys come and go, that it’s impossible to keep even the most beloved teams intact for long. Since Oct. 27, 2004, the same night Schilling raised a champagne bottle and gave his famous “To the greatest Red Sox team ever!” toast in St. Louis, could anyone have imagined that two-thirds of his teammates would belong to other teams within 14 months? But hey, that’s sports in the 21st century — you win a championship, the moment passes, and that’s that. In some cases, like with Pedro, Mueller, Lowe and Damon, employees leverage their situations into lucrative contracts with other franchises. In other cases, like with Millar, Bellhorn and Embree, companies cut the cord and try to find someone more productive. And once in awhile, you have someone like Varitek agreeing to stick around at a slightly reduced rate, and only because he’s happy where he is. But everyone makes the decision based on what’s best for him. That’s how the real world works. The question remains: If you were Johnny Damon, would you have passed up $12 million to return to a team that didn’t really seem to want you back? Didn’t think so. He’s not Anakin, he’s not Judas, he’s not the Reverse Earl Hickey. He’s just another businessman who followed the money and never looked back. In other words, he’s a professional athlete. 1. Compare how the Sox handled the Damon situation to how they handled the Varitek situation last year: When Varitek became a free agent, they made it clear from the beginning that he was the most important position player on their team and that they needed to bring him back. There were some stopgap replacements mentioned in the papers, but only in the spirit of “we have to have a few emergency plans in place just in case a catastrophe happens and he leaves.” Nobody really thought he was going anywhere. And he didn’t. What happened when Damon ended up in the same situation? They made him one offer (four years, $40 million) and refused to budge. The newspapers ran a steady stream of rumors about the Sox trying to find Damon replacements in the outfield — Carlos Beltran, Joey Gathright, Jeremy Reed, Coco Crisp and others — as they were proactively looking for alternate options. They made two other high-profile moves (the Beckett trade and Loretta-for-Mirabelli). 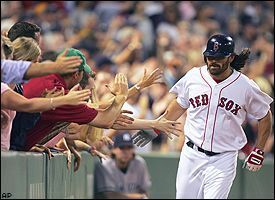 Nobody ever came out and said, “All right, we HAVE to bring Johnny Damon back.” Even when he was negotiating with the Yankees over the past few days, and Boras was warning him that he might flee Boston, they didn’t seem that concerned. So can you really blame Damon for leaving? 2. Have you seen a free agent contract in any sport that someone wasn’t paid 25-30 percent more than what they were worth? Damon was worth $40 million and ended up getting $52 million. Maybe that wasn’t his perceived value on the open market, but the fact remains, it takes only one franchise to decide someone’s value. 3. Hidden factor in the Damon saga: Scott Boras (Damon’s agent) and Larry Lucchino (the con artist who’s currently running the Red Sox into the ground) have been battling for over a decade — I’m not even sure they’re allowed to be in the same room without special clearance from the federal courts. Did you really think that Boras wouldn’t relish the chance to stick it to the Red Sox and Lucchino, especially after what happened with the A-Rod Saga two years ago? These two are like the Summer Roberts and Taylor Townsend of major league baseball, only they’re not even remotely fun to look at. 4. Honestly? I didn’t want the Red Sox to re-sign Damon for $40 million over four years, much less $52 million. All the classic “Guy signing a big contract and going into the tank” signs were there. For one thing, he has a ton of miles on him — over 1,500 games in the past 10 years in one of the most grueling roles in the league (leadoff hitter, centerfielder) — and by the end of last season, he was breaking down like Denzel Washington at the end of “Man on Fire.” Physically, he’s had ongoing problems with his right shoulder and post-concussion syndrome (the latter stemming from his ugly collision with Damian Jackson in the 2003 playoffs). His offensive numbers have dipped after the All-Star break for every season in the last four, including a dramatic drop last season (hitting .343 with an .859 OPS before the break and .282 with a .740 OPS after the break). And he’s hitting his mid-30’s next November.